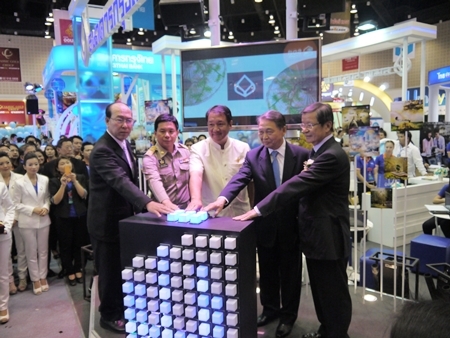 Deputy Prime Minister and Finance Minister Kittirat na Ranong and Deputy Governor of Chiang Mai Chuchart Keelapaeng joined Bangkok Bank Executives in opening their booth at the Money Expo 2012. The Money Expo 2012 kicked off at Central Airport Plaza on Friday, November 9, 2012 with Deputy Prime Minister and Finance Minister Kittirat na Ranong opening the event that will run through the weekend. Deputy Governor Chuchart Keelapaeng was also on hand to join bankers, business people and Chiang Mai residents in opening the expo that features booths from all banks, as well as many insurance companies, investment brokers and other businesses related to financial services. Bankers are on hand to offer advice, recommend various types of accounts, discuss car loans, gold investment, life insurance and much more. The Money Expo is at Central Hall at Central Airport Plaza through November 11, 2012. The Islamic Bank of Thailand was just one of many banks with representatives at the event that runs through November 11, 2012. 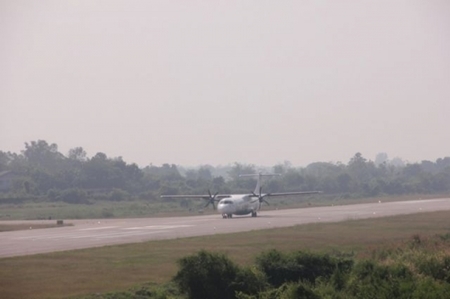 The local meteorological department and Lampang Airport reported thick fog, affecting aircraft landing this morning. Thiva Phanmaisri, head of the Lampang meteorological department, said that thick fog has covered the province for the whole week, as a result of a weather system trough, blanketing the upper part of the province and limiting the visibility for aircraft pilots and ground personnel. On Friday morning, a reported visibility of 250 metres was considered so low that Bangkok Airways’ 70-seat Bangkok-Lampang aircraft was forced to postpone landing by one hour. Thick fog is normal in winter in this Northern Province, and Lampang airport’s runway is near Phrabat Mountain, so cold air masses from the mountaintop flow southward to cover the runway, Mr Thiva said. The Lampang meteoreological station must check the weather condition regularly to work with the airport and the air traffic control tower, he added. (MCOT online news). The Ministry of Information and Communication Technology (MICT) recently announced that they have implemented 3,000 public Wi-Fi hot spots around Chiang Mai in conjunction with AIS. ICT Free Wi-Fi is part of MICT’s free Wi-Fi policy called Smart Thailand Policy which intends to install 100,000 free Wi-Fi hotspots around the country by the end of this year and 400,000 by 2015. Residents must register for the program at www.ais.co.th/ictfreewifi. The free service offers a download speed of 10 Mbps for five hours per month through AIS partner – 3BB Wi-Fi. Registration is open until August 31, 2013. Hotspots can be found around the city; in schools, shopping centers, the airport, hospitals, government offices, on Tha Pae Walking Street, Waroros, Chiang Mai Night Safari and parts of Nimmanhaemin Road. At an evening reception at the prestigious Siam Society in Bangkok on November 8, German Ambassador, H.E. Rolf Schultze, highlighted Ayutthaya and its ongoing conservation work. Heavily damaged during the heavy flooding of Central Thailand in 2011, the former Siamese royal city (1351-1767) will be rehabilitated and the Federal Republic of Germany is part of the ongoing conservation and restoration project. Especially Wat Ratchaburana will be restored to its former glory and conserved for generations to come. It was up to the guest speaker Prof. Dr. Hans Leisen, who gave a delighted talk on the technics involved. Under the theme "Ayutthaya-Borobudur-Angkor: Three World Heritage Sites with different challenges for conservation" Professor Leisen told the audience that all three World Heritage Sites, dating from different times, bear their individual art and religious values but also their individual preservation problems. While Ayutthaya's temples are constructed in brick and laterite stone and decorated with stucco ornaments, Borobudur in Indonesia is built with igneous rocks deriving from the surrounding volcanoes. Finally, Angkor shows different building materials like sandstone, laterite and brick with stucco decoration. All the monuments at the three sites have their own degradation history. For each of them individual preservation plans have to be compiled and well adapted conservation materials must be developed. Every intervention has to be prepared and accompanied by detailed scientific studies and documentation. Each step needs efficient quality control tests. Last not least, the lecture sucessfully showed the continuous work of Professor Leisen at outstanding World Heritage Monuments. Thailand's northern province of Chiang Mai ranks as the top destination for Thais wanting to travel during the annual cool season, according to a survey. The National Institute of Development Administration (NIDA) conducted the opinion poll among 1,245 Thais nationwide at all educational levels and careers concerning the tourism season in this cool season. According to the survey, some 39 per cent said they wanted to go to Chiang Mai, 11 per cent said they chose Loei province, and 9 per cent said they wanted to go to the resort island of Phuket. Regarding travel companions, 73 per cent said they wanted to go with family, 19 per cent said with friends, and 8 per cent said with lovers. For each journey, most of those surveyed said they planned to take three to four days for a holiday and to spend around Bt14,500 per person. Concerning types of accommodation, some 30 per cent said they would stay at resorts, 23 per cent at hotels, and 20 per cent at relatives' or friends' homes. Foreign Secretary William Hague visits Thailand on 6-7 November 2012, after attending the 9th Asia-Europe Summit in Laos. During his short but packed visit he will meet Thailand’s Prime Minister Yingluck Shinawatra and take forward the UK-Thailand Strategic Dialogue. This covers foreign policy, trade and investment links, and global challenges including climate change. Alongside political figures including Kittiratt Na-Ranong, Deputy Prime Minister and Finance Minister, Surapong Tovichakchaikul, Foreign Affairs Minister, and Abhisit Vejjajiva, Leader of the Opposition, the Foreign Secretary will also meet top Thai and British business leaders. The Chiang Mai Municipality will honor World Diabetes Day to be held on November 14, 2012 with a series of free health checks for residents. Held at the Municipal Building, there will be blood sugar tests, as well as blood pressure, weight, bone mass, eye checks, BMI tests, along with consultants with health officials. Diabetes is a chronic disease that affects over 285 million people worldwide and also remains a problem in Thailand. 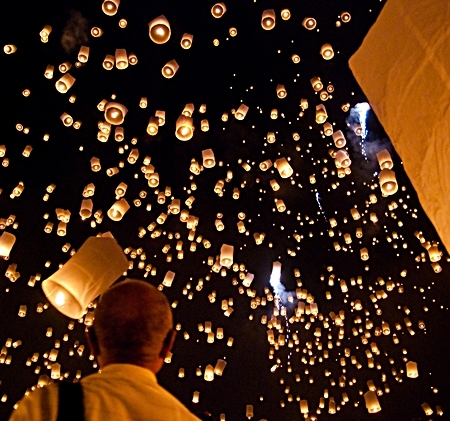 The health officials will be available on November 14 from 8 a.m. to 3 p.m.
Chiang Mai Governor Tanin Subhasaen called on everyone to help spread awareness of the dangers of hot air balloons or Khom Loy, during the Loy Krathong Festival. He warned the public to avoid using any steel materials that could cause electrical fires or shock were it to land on electric lines. The public was asked to avoid launching large hot air balloons and to announce a ban on the launching of balloons near the Airport. Raweewan Netrawesana, the Director of Chiang Mai International Airport, said that the Yee Peng or Loy Krathong Festival was a cause of concern to the airport for the hazards balloons can cause airplanes and asked the public to avoid launching any balloons that could come near the airport before 9:30 p.m. She asked the public to call the airport if they had any questions as to when or where to launch the balloons to avoid any hazards for flights. 0-5392-2319. 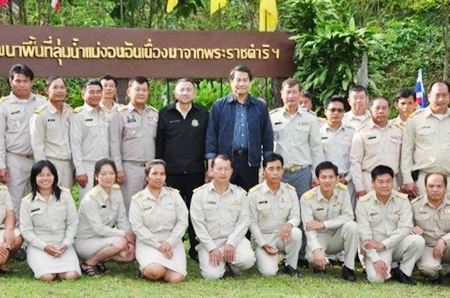 Privy Councilor Palakorn Suwanrath visited several Royal projects around Chiang Mai. Privy Councilor Palakorn Suwanrath visited Chiang Mai on October 15 to inspect and monitor reforestation projects implemented by the Queen in a Royal Project that was initiated in 1994. The reforestation project has worked to reclaim degraded forest lands with the cooperation of the Region 3 Army and the Forestry Department which has been assigned responsibility to 150,000 rai of forest land. The project works to restore the natural balance in nature as well as educate people living near and in forested areas to preserve and protect the forest. Privy Councilor Palakorn Suwanrath visited areas undergoing reforestation in Chiang Dao and Chai Prakan, as well as implementation of the watershed at Mae Ngon in Fang under the watershed development project of HRH Princess Maha Chakri Sirindhorn which was established in 2008 after flooding there. The Royal Project works with the Chai Pattana Foundation to coordinate with government agencies in helping people and restoring the natural resources and environmental watershed in Mae Ngon. Mae Ngon has many Chinese immigrants from Yunnan as well as refugees from Myanmar. Bangkok Airways has introduced check-through service at Chiang Mai Airport for passengers with connecting flight to international destinations with participating carriers. The new service will enable passengers’ baggage to be checked-through to their final destination and complete immigration formality. Passengers are required to present their international flight details with the minimum connecting time of 1.5 hours. Bangkok Airways international check-in counter is located at raw 11-12 at Chiang Mai Airport’s international terminal. See their website for participating carriers. The Japanese Consulate in Chiang Mai is joining together with Mae Hong Son Provincial government and Khun Yuam District at a festival at theThai Japanese Friendship Memorial Hall remembering those Japanese soldiers who remained in Khun Yuam after the end of WWII. 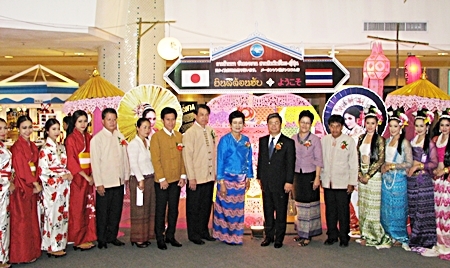 The announcement of the event to be held in Mae Hong Son’s Khun Yuam District on November 10 and 11, 2012 was held at Central Airport Plaza on Saturday, October 19 and attended by Mae Hong Son Governor Naruemol Plawat and Japanese Consul General Kazuo Shibata as well as District Officer for Khun Yuam Chancha Sisakhien and other Mae Hong Son Provincial officials. The event will coincide with the blooms of Bua Thong or Mexican Sunflowers that fill the fields in Khun Yuam during the cool season and the start of the Bua Thong Festival on November 11, 2012. There will be traditional Japanese, Thai and Shan cultural performances as well as food and handicrafts. Municipal firefighters battle the blaze that engulfed the roof of the Boutique House Nipha hotel on October 17, 2012. A fire broke out at the Boutique House Nipha at 11:15 a.m. on October 17, 2012 engulfing the second floor kitchen in flames. Firefighters arrived at the hotel on Rajchiangsaen Road to find the fire burning violently on the second floor of the building, the Municipal Fire Department firefighters used a high pressure hose to douse the flames which took a half an hour to put out. Fire investigators found that the fire started in the kitchen before quickly spreading through the unoccupied floor causing around 80,000 Baht worth of damage. Forensic investigators will try to determine the exact cause of the fire but it is believed to have been an electrical short. 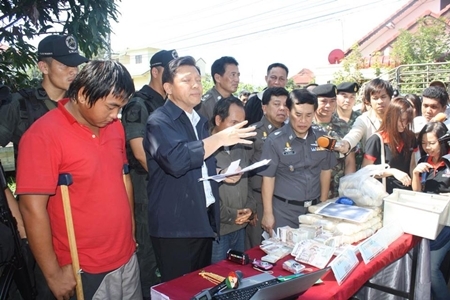 Police display the cash and other assets seized in the raid on the home of Thavorn Somchit on October 21, 2012. Thavorn’s assets have been seized according to the law that allows police to confiscate the assets obtained from illegal activity. Police raided the home of a suspected ringleader of a major drug trafficking ring on October 21, 2012 and seized assets and property valued at over 100 million Baht. The Secretary of the Office of Narcotics Control Board Pol. Gen. Pongsapat Pongcharoen, Commander of Police Region 5 Pol. Lt. Gen. Suthep Dejraksa and more than 100 officers from the ONCB, Border Patrol, Pha Muang Task Force and members of the United States Drug Enforcement Agency raided a home in Pimuk Village 1 in Sansai where they arrested suspected ring leader Thavorn Somchit, also known as Ar Jong Saelu, age 33, a man they consider a major player in the Hui Chinese drug trafficking network that sends drugs to be sold in Central and Southern Thailand. Eakmorn Saeyang, age 23, was also arrested. Authorities seized two cars, 7 pickup trucks, 7 motorcycles and a tractor as well as 672,600 Baht in cash, gold weighted at 14 Baht valued at around 349,000 Baht, and 9 bank accounts with deposits of more than 200 million Baht. Additionally police seized the titles to land including a 4 rai piece with the house and 8 plots of farmland valued at approximately 100 million Baht. The raid was the result of the arrest of 4 people involved in Thavorn’s drug trafficking network in Nakhon Sawan with 200,000 methamphetamine pills. The investigation led police to Thavorn in Chiang Mai. Banharn Loongtun re-enacts his series of 7-11 robberies for the police after they apprehended him at an internet café on October 24, 2012. Police apprehended a young Tai Yai man suspected of a series of 7-11 and gas station robberies around the city during October. Police Region 5 Commander Pol. Lt. Gen. Suthep Dejraksa announced the arrested of Banharn Loongtun age 19, of Wiang Haeng District. A string of convenience store and gas station robberies over several weeks in October involved a suspect wearing a mask and helmet, black jacket and carrying a black BB gun. The suspect would enter the store between 1 a.m. and 5 a.m. and threaten the clerk with what appeared to be a gun. Banharn confessed to police that he had robbed the Baan Srisan branch of 7-11 in Hang Dong, the Sri Ping Muang 7-11 branch on October 13, the Sri Bua Neng branch of 7-11 on October 19 and the LPG Gas Station on Mahidol Road near Chiang Mai International Airport. He told police that he had worked as a construction worker but when he lost his job, purchased the toy gun with the intention of robbing stores to pay for playing games on the internet and purchase goods. He was arrested at an internet café behind Chiang Mai Rajabhat University at 1 a.m. on October 24, 2012.